Being able to generate more than $14 billion in cash over one quarter is a nice problem to have. 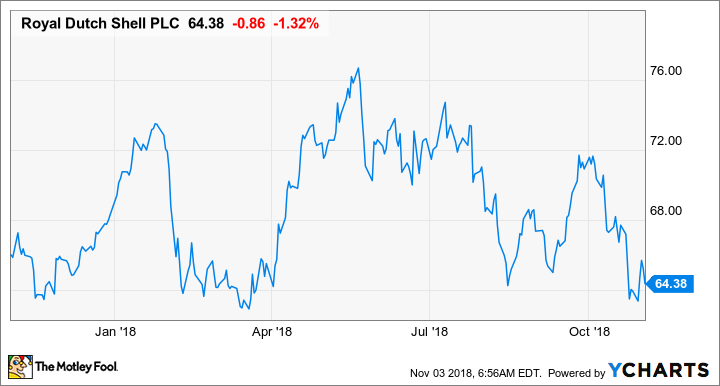 This past quarter, Royal Dutch Shell's (NYSE:RDS-A) (NYSE:RDS-B) results showed the company can fund just about anything it wants right now. A large capital expenditure program? Yup. Pay down some debt? Sure! Fund its dividend? Of course! How about a $2 billion share repurchase program on top of all of that? Why not! The reason it is able to do this is that the company is generating an almost unfathomable amount of cash right now. Shell's management said this was the most cash it has pulled in since the second quarter of 2008 when oil prices were in the $110-to-$120-per-barrel range. Let's take a look at the company's most recent earnings results and see what Shell is planning to do with all that cash coming in the door in the coming quarters. DATA SOURCE: ROYAL DUTCH SHELL EARNINGS RELEASE. ADS = AMERICAN DEPOSITARY SHARES. It's really hard to just sit in awe at Shell's cash flow results from the quarter. Perhaps even more incredible is that it generated that result with a large build of working capital in the quarter. According to management, cash flow for the quarter was $14.7 billion absent changes in working capital. The surprising thing was that the company's net income results didn't quite follow suit compared with the prior quarter. That's in part due to a one-time gain of $1.05 billion in the prior quarter from the sale of its stake in Malaysia LNG. Other than that, it was a rather remarkable quarter where the company benefited immensely from higher oil and gas prices that boosted its two production segments: integrated gas and upstream. Data source: Royal Dutch Shell. Chart by author. Total production for the quarter was down 5.2% compared with the same quarter last year to 3.59 million barrels of oil equivalent per day. Management noted that excluding asset sales and scheduled maintenance shut-ins, production for the quarter was up 4% year over year. Shell announced first oil from one of its floating production, storage, and offloading (FPSO) vessels off the coast of Brazil. It expects to start another three of these FPSO facilities in Brazil by the end of 2019. It also won the operating stake in a new offshore block in Brazil that brings Shell's net acreage there to 2.7 million acres. Management also started processing gas with its Prelude floating liquefied natural gas (FLNG) facility and expects first production by the end of the year. As part of its divestment plan, the company announced the sale of its North Sea production assets in Denmark and its retail marketing business in Argentina. Combined, the two disposals netted Shell $2.8 billion. After announcing the start of its share buyback program the same day as its second-quarter earnings release, the company has already completed $2 billion in share repurchases and authorized another $2.5 billion of buybacks under its $25 billion share repurchase plan. The highlight of the quarter wasn't any new project starting up or Shell's buyback program but the announcement that it was going ahead with the construction and development of LNG Canada. This is a 14-million-ton-per-year facility in British Columbia that will serve the Asian gas market. In Shell's prepared remarks for the quarter, CFO Jessica Uhl highlighted the reasoning for giving the project the go-ahead. We gave the green light to invest in LNG Canada at the beginning of October. This is the first LNG Project on the west coast of North America and Shell has a 40% working interest. LNG demand is expected to double by 2035. LNG Canada shows the confidence we have in the future of natural gas and LNG. This project is perfectly located to meet the growing demand with low-cost natural gas from British Columbia. This is especially true for customers in Asia. It is also due to come on stream at a time when we expect a global LNG supply shortage. Construction has already begun, and we expect to produce first LNG before the middle of the next decade. As with all of our major investment decisions, we took a disciplined approach to improving the competitiveness of the project before we made the final investment decision. It has a strong and resilient cash flow profile. Shell also has significant integration advantages from the upstream through trading. Both of these aspects of the project contribute to it achieving an internal rate of return of around 13% at a price of $8.50 per MMBtu at real terms 2018, delivered in Japan. And if we decide to proceed with Train 3 and 4 together with the other joint venture partners, this expansion would provide further upside to project economics. The things that big oil management teams get criticized for the most is their capital allocation decisions. No matter what they decide to do, some analyst will say the company should have done the other thing. Right now, with Shell generating so much cash, it has the luxury to do everything all at once. The ability to produce so much cash in a single quarter means there is room for dividends, paying down debt, buying back stock, and funding the largest capital expenditure program among the integrated majors. Heck, Shell even had a little cash left over this past quarter after doing all those things. Giving LNG Canada the green light adds to an already long queue of projects. Between now and the end of 2019, the company has more than 600,000 barrels per day of production, 2.4 million tons of LNG, and 0.4 million tons of petrochemical products. Management believes that it can maintain its current pace of $25 billion to $30 billion in capex per year while still completing its $25 billion in share repurchases by the end of 2020. For investors, it's hard to critique what Shell is doing with its cash because it seems to have more coming in the door than it knows what to do with.